The first Polish radio transmission of the Holy Mass and its circumstances. 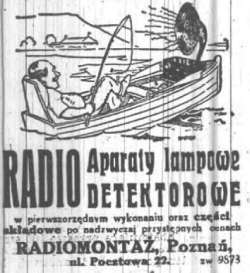 During 1925-1927 the first Polish radio stations dedicated to the general audience came into existence in Warsaw, Cracow and Poznan. From the very beginning the radio transmissions of Holy Masses from the cathedral at Ostrow Tumski were the part of the broadcasting activities of the Poznan Radio. This was made possible by cardinal August Hlond, the archbishop of Gniezno and Poznan, whose decision was influenced by Father Stanisław Adamski from the Metropolitan Chapter and by the leadership of the Poznan Radio – Kazimierz Okoniewski, Franciszek Łukasiewicz and Zdzisław Marynowski. Cardinal Hlond took the decision on radio transmissions without alignment with the Holy See and – as it turned out later – against the position of Pius XI and of the Roman curia. Pius XI’ negative opinion sent in 1927 to Prague as an answer for an inquiry of the local bishop has stopped for many years the radio transmissions of sung Holy Masses in Czechoslovakia. Still in 1936 the regular transmissions of the Holy Mass were performed only in Austria, Holland, Yugoslavia, Poland, USA, Hungary and Italy; rare and occasional transmissions took place in Australia, Belgium, Brazil, Czechoslovakia, Denmark, France, Luxembourg, Germany, Switzerland, Great Britain; and in Portugal there was no transmissions at all. The time consuming process of acceptance of that form of apostolate was brought forward through the practice rather than the decisions made by the Vatican. Even the positive opinion of a theologian of the Holy Office and the Congregation of Holy Rites was not officially published. From the historical perspective one can have an impression, that the “rigidity” of the Roman curia, which does not see “the errors, the outdated forms, the needs” as described later by cardinal Hlond, was an illustration of proceedings of the Church’s offices, which were active on the radio field. The microphone of the Poznan Radio, set up for the first time on 16th of April 1927 in the Poznan cathedral has inaugurated a long history of the Polish radio transmissions of Church liturgy, a history that lasts until today, with a break caused by the second world war, and then by the years of the communistic occupation. After the transmission of the resurrection Mass, the listeners could follow the celebrations on Easter Sunday and Easter Monday (17th and 18th of April 1927) – the first transmissions of the Holy Mass in the history of the Polish radiophony. 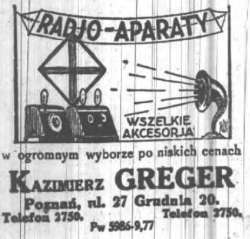 The broadcast on 3rd of May 1927, wrongly considered so far as the first Polish radio transmission of the Holy Mass, was in fact the first Mass retransmitted by the radio stations in Warsaw and Cracow. The Poznan transmissions has taken their place on the radio program mainly because of the one reason – they were phonogenic, live, suitable for listening. This was achieved in large part thanks to liturgical music, which was of the top level. The cathedral choir directed by Father Wacław Gieburowski has triggered audience’s excitement with the compositions of Palestrina and other excellent artists. The phonogenity was achieved also thanks to a group of experienced preachers, whose homilies became an important contribution to radio apostolate. The sermons brought the Gospel onto the radio waves, enabled the Church to fulfill her mission and also to reach her pastoral goals, especially regarding the pastoral care of the sick and elderly. The history of archdiocese of Poznan and the history of Polish radiophony got together at the moment of birth of radio station, which was considered to be a common good for the whole society of the region – its stakeholders were exclusively local municipalities. The Poznan Radio, which was built from the scratch for public money, has taken over a responsible role of participation in the life of the local Church, and the primate of Poland and his collaborators noticed the need of liturgy and Gospel in radio program. From the historical perspective, we can assess this undertaking as a successful attempt of a friendly cooperation between the Church and social mass media, an innovative attempt with durable fruits, that stretched far behind the borders of one local Church, radio station, city and region. The objective of this book is to shed some light on one historic moment – the events taking place in Poznan in 1927. In order to offer a complete view at the first radio transmissions of liturgy in the history of the Polish Church, the analysis of theological and canonical context connected to decisions of Roman congregations was performed. Apart from presenting already known rulings of the Vatican offices, this work considers also a votum of a theologian of the Holy Office, Father Jan Hudeček on the transmissions of Holy Mass. The research on Radio Poznan’s broadcasts allows to correct some firmly established errors in the bibliography of the subject. The first one is the wrong date of Pius XI’s approval of transmissions performed by Radio Nacional from Salamanca (1938, not 1928). The second one is the date of the first Polish transmission of Holy Mass, which took place on 17th April 1927, not 3rd of May 1927 and it was performed by the Poznan Radio.